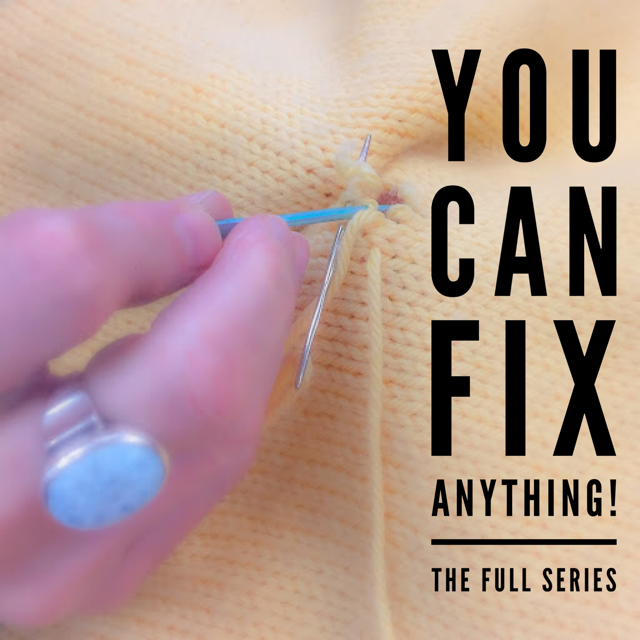 This full series sign-up includes all three sessions of You Can Fix Anything! at a discounted tuition rate. During Session A we will be learning to “read” our knitting. This class will focus on the individual rows of our knitting. How does the yarn in each row interlock with the rows above and below to create different fabric? How does this change between fabric swatches? Learn where each strand goes and how to follow them with your eye using a contrasting color of yarn (useful for “over knitting” techniques) and how to sew in ends invisibly. This skill is vital to Fixing Anything because it is the foundation of understanding our stitches and how they combine to become fabric. Session C focuses on CUTTING OUR KNITTING in order to learn how to darn holes. We will explore the Visible Mending Movement, learn to darn our knitting and get more wear from our handmade clothing. This class will focus mostly on our stockinette swatch with the option for fast fixers to choose other swatches to work on as well. This class translates nicely beyond handknits and can be applied when darning sweaters and socks- even store bought knitwear.